Pegi Christiansen’s residency at Lynden is built around the idea of distance. Early on she reached out to three other artists critical to her development as a performance artist--Theresa Columbus in Baltimore, Jennifer Holmes in Los Angeles, and John Loscuito in Fort Myers, Florida--and the four started creating art together last September. This project, Distance, will culminate in an exhibition and performance at Lynden on October 10-11. One of the things Christiansen and her collaborators do every month is make "exquisite corpses." Although it may sound a bit gruesome, it is a terrific way of making work together--even if you are far apart--and has long been popular with artists and writers interested in ways to accumulate images and words. Pegi used to make exquisite corpse drawings with her daughter Caitlin on plane rides. Cait would draw a head toward the top of a sheet of paper, and then fold it over so Pegi could only see the marks for the neck. Then Pegi would shield the paper from Cait and draw a body, folding the paper again so only her marks for the start of the legs showed. Cait would finish and then they would unfold the paper to see the full picture. Theresa Columbus will show you how to do this in her morning workshop for children. As Christiansen and her fellow artists have been building their project, they have been weaving images and words at a distance. The artists are meeting at Lynden in August and will use their proximity to start weaving in movement and voices. Jennifer Holmes will lead an afternoon performance workshop for adults based on the same kind of interdisciplinary weaving, all in three hours instead of a year. Registration: Space is limited; advance registration is required. Register by phone at 414-446-8794. Visiting artist Theresa Columbus will introduce you to the exquisite corpse, a way of collaborating that allows you to add to a larger whole while only seeing a small part of what others have contributed until the very end. Using this method, invented by the Surrealists in the 1920s, we will create fantastical creatures using tempera paint as well as abstract shapes using colored pencils--and we'll make enough for everyone to have work to take home. Dress for walking: we'll take a walk through the sculpture garden for inspiration. 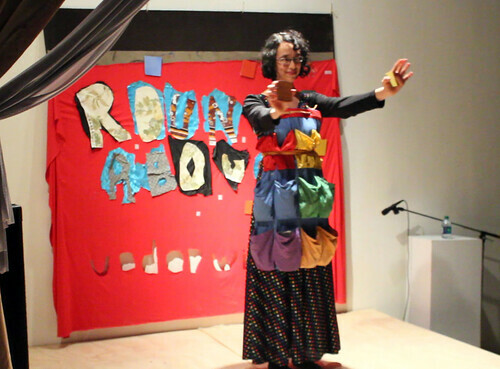 Theresa Columbus is a performance artist, playwright, filmmaker and educator. For the last 15 years she has performed extensively in Baltimore and Milwaukee, and has toured the country with her poetic plays and solo performances. She has also made, co-directed, or acted in many film and video projects. She collectively started and ran Darling Hall, an experimental performance space here in Milwaukee, for five years. For the past six years, she has been teaching theater and art to elementary and middle school kids in school or in after school programs. She recently co-directed a performance variety show that is a collaboration between youth and adult artists called Kidult: the Kids and Adults Show.